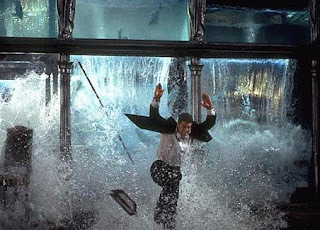 You remember the scene in Mission Impossible I with the fish tank restaurant? I inadvertently recreated that scene in my dining room last night. All I did was pick up the power adapter for my laptop, which was sitting beside the fishbowl... the plug did an amazingly good impersonation of a pendulum and swung into the side of the fishbowl. 25 pints of water suddenly discovered that there was no glass to hold them inside and proceeded to scatter bits of fishbowl, pebbles and fish (only one of those) over the dining room floor. The water also poured onto the mains power socket and tripped the electricity, plunging the house into darkness. Amazingly, the fish survived the experience. We hastily poured some tap water into a bowl and (after searching for a minute or so) found the fish and dropped it into the fresh water. It looked kinda dead for a while, but was back to its usual self half an hour later. (Actually, its 'usual self' looks kinda dead anyway as the fish has been ill for months now, but seems quite intent on not dying). my husband hopes you have a waterproof laminate floor. But the fish didn't survive long. It died (not unexpetedly) about a week later. We got that fishbowl in June last year. The fishbowl lasted a year. In that time it has been home to five different fish (generally two at a time), none of which has lasted longer than seven months. Sigh.